Even with London fashion week on, all eyes turned to the red carpet on Sunday for the final major awards show of the season – the Oscars to see who wore what and why? Before I get into the fashion I have to say how disappointed I was in the Oscar telecast to see that in the Memorial section of the night that they left off the amazing Joan Rivers who has done film work as well as being the most wonderful host of Fashion Police! But enough, time to focus on the looks that got the internet a buzz as the celebrities, movie stars and others walked the red carpet (that black ball dress that was worn by one of the winners in the documentary field was simply amazing for all the wrong reasons but did give Neal Patrick Harris one of his best unscripted lines of the night). In my humble opinion this year there really were no glaring stand outs for worst dressed and most people got it right. Oh yes there were comments about some color combinations and if the shoes were the right colour but overall it was a pretty glamorous, fun red carpet this year filled with some fantastic fashion along the way to keep us delighted. So here are my 15 best dressed looks from the night (I coudn’t just do 10). They are in no particular order and yes, a couple of men made my list for this year! Lupita Nyong’o in custom Calvin Klein Collection, Chopard jewellery and Nicholas Kirkwood shoes always seems to get it right. She is a real star and this was a stunning choice following on from her brilliant red dress from last year. 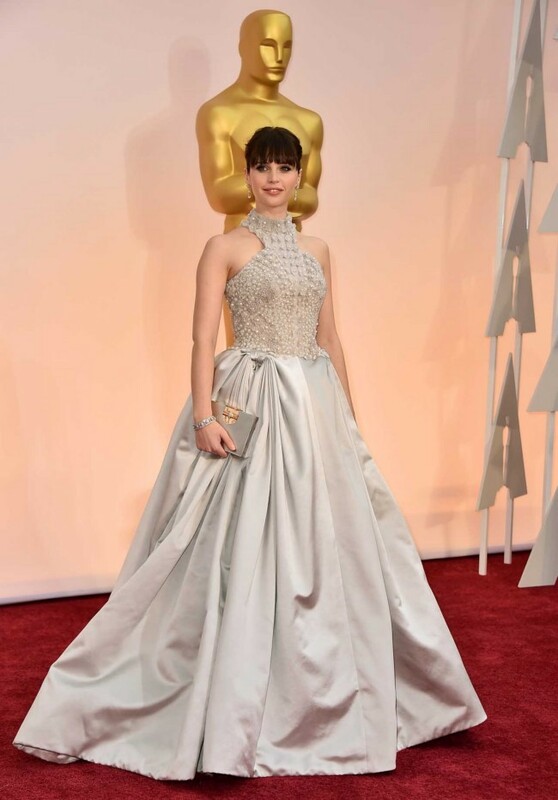 Felicity Jones in Alexander McQueen, vintage Van Cleef and Arpels jewellery and bag. Felicity was a real star in this Alexander McQueen dress and looked like a real princess. Naomi Watts in Armani Privé was a bold choice and one that she carried off with real style. This was an amazing dress and really showed off her body perfectly. Julianne Moore in Chanel was also a delight. She sometimes makes some interesting choices for the red carpet but this time she hit all the right buttons and got the most amazing dress that really worked well for her. Kerry Washington in a Miu Miu dress and Christian Louboutin shoes. Kerry always looks polished, poised and amazing on and off the red carpet and this was no exception. The color and the design were perfect for her. Rita Ora in Marchesa was one of my top picks for the night. It was figure hugging in all the right places and showed off her body perfectly and the colour was divine! Reese Witherspoon in a Tom Ford dress and Tiffany and Co jewellery. This was simple elegance and pure style from Reese. She always looks like a movie star and this year was no different. Cate Blanchett in a Maison Margiela dress and Tiffany and Co jewellery. This was a dress made especially for her and you could tell by the tailoring that it was perfect for her and with the addition of the stunning necklace she nailed it! Nicole Kidman in Louis Vuitton and Harry Winston diamonds was simple, elegant and with the shoes and diamonds an inspired choice. She looked wonderful as usual! Lady Gaga in custom Azzedine Alaia was my pick of the night. Lady Gaga always gets the fashion commentators talking and this year was no exception but she really shone brightly in this custom gown. It was high fashion at its best and perfect for the red carpet. Jessica Chastain in Givenchy and Piaget jewellery was elegant, poised and a real treat to behold. Scarlett Johansson in Versace and Piaget earpiece was another highlight for me in a dress that was a colour that not everyone could pull off. Scarlett did and she looked like the Hollywood star that she is. 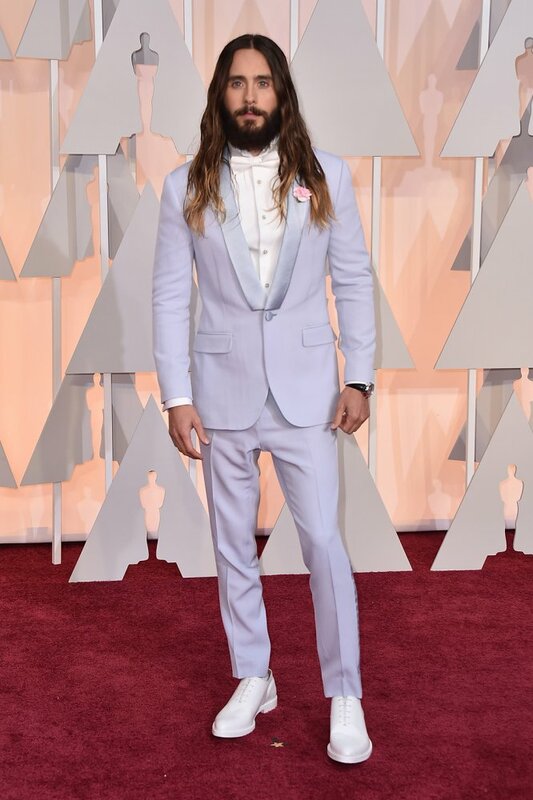 Jared Leto in Givenchy was one of my favourite male celebrities on the red carpet. The pale blue suit and white shoes were fantastic. He always likes to push the fashion boundaries for men and sometimes hits the mark and sometimes doesn’t but this time he really hit the mark. 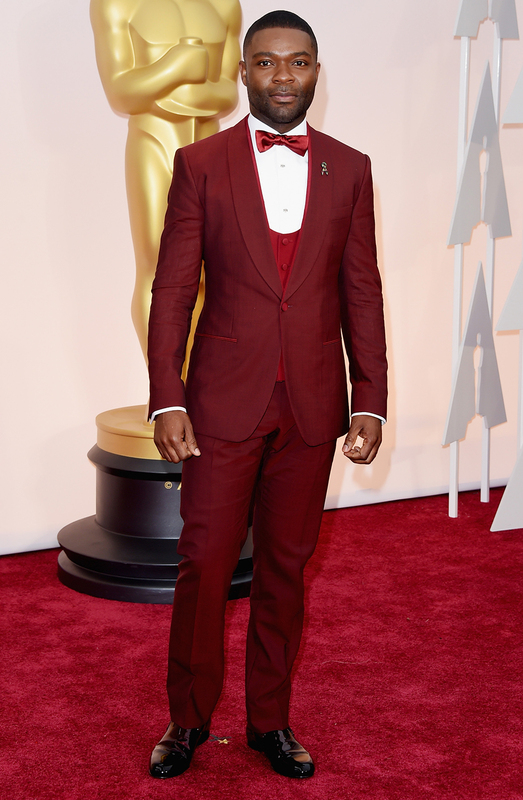 David Oyelowo in Dolce and Gabbana. This was my favourite men’s look for the night. It was a bold statement to make and it was inspired! He looked immaculate, stylish and just stunning in this suit. It was a real fashion hit! So there you have my choices for my 15 top dressed celebrities on the red carpet this year. Some you might agree with and you might also think that I have left some out but hey it is all in the eye of the beholder and the commentator and we all have different styles that we do and do not like. I hope you enjoyed my choices!